Norfolk Island a small patch of land formed from the remains of an extinct volcano that is located in the Atlantic off the east coast of Australia due north of New Zealand. The island has since the beginning of the twentieth century belonged to the Commonwealth of Australia as part of a territory that includes a pair of nearby islands. Norfolk Island has been home to all kinds of people, from the original Polynesian settlers to criminals and castaways, including descendants of Fletcher Christian and the mutineers who took control of the British ship the Bounty in the 1850s, shortly after the last of the prisoners were removed. Today the island offers an intriguing mix of modernity and tradition amid stunning natural landscapes. A full 10% of the land is set aside for the Norfolk Island National Park, which preserves a remnant of the lush forest that once covered everything. 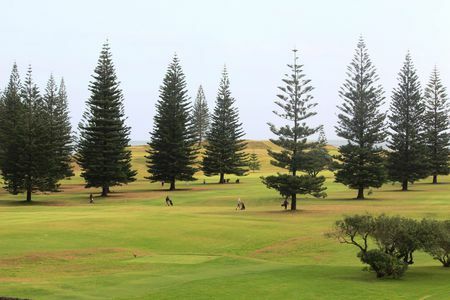 There is one golf course to be found on the island, the Norfolk Island Golf Club, located on the island's southeastern edge in the administrative capital of Kingston. This is one of the only courses in the world that is situated within a World Heritage site; not surprisingly, it features some of the finest scenery a golfer is likely to experience, which makes it a big draw for Australians and New Zealanders alike.